When transformation is the mantra, information is power. Established in 1996, CONSTRUCTION WORLD (CW) is India’s premier and largest circulated construction business magazine, covering the gamut from projects, policies and people to topical concerns, trends and technology, with reason, intelligence and objectivity. This flagship publication of ASAPP INFO GLOBAL GROUP, with two separate editions in India and the Gulf, counts among its esteemed readership architects and builders; equipment and building material companies; EPC and engineering companies; civil and structural contractors and engineers; interior designers; government agencies, policymakers and bureaucrats; financial institutions; and high-net-worth investors. Its research-driven features, timely news reports, business insights and opportunities, material and market updates, showcase of Indian and international benchmark projects, interviews with change-agents, and informed policy recommendations, backed by meticulous editing and vibrant design, have won the magazine accolades aplenty, including the ‘Best News Magazine’ at the CIDC Vishwakarma Awards; the ‘Best Single Issue’ and ‘Best Feature Article’ awards at The Tabbies; and first prize in the ‘Multimedia Strategy and Business Model’ category for best representation across all media in Asia, at the Asian Multimedia Awards in Manila. Testament to the influence of the magazine are these numbers: Around 90 per cent of readers act on seeing advertisements in CW with 41 per cent contacting the advertiser straightaway; and 62 per cent of CW readers read more than eight issues per year with 78 per cent of readers spending two hours reading the issue. 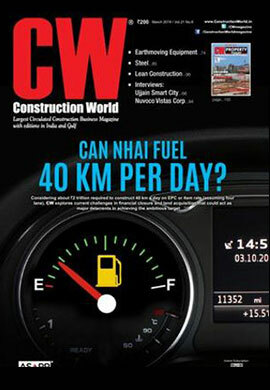 The magazine also has a robust digital presence; its website www.constructionworld.in is a preferred source of news and information, with over 35,000 unique visitors and around 4 million hits a month. What’s more, the CONSTRUCTION WORLD ANNUAL AWARDS for construction, equipment and building material companies and the CWAB AWARDS for top architects and builders honour excellence in the industry, shining the spotlight on achievers and inspiring potential contenders. Going forward, CW remains committed to catalyse growth and partner in the nation-building process with valuable information, insights and analyses. This indeed is the promise of ASAPP Info Global Group, which, over two decades, has reflected India’s transformation, echoed its aspirations, addressed its challenges and predicted its potential across economically crucial sectors like construction, infrastructure, power, real estate, manufacturing, automobile and textiles. A true thought leader, ASAPP Info Global Group has radically transformed the B2B universe with its dynamic offerings in the print, Web and events space.